The fight against extremists from the Islamic State (IS) militant group is heating up on two fronts. Since May 23, a coalition consisting of the Iraqi army and primarily Shi'ite militias, backed by U.S. air strikes, has advanced towards Fallujah, 40 kilometers west of Baghdad. There are estimates that between 50,000 and 100,000 civilians remain in the city, and some residents told USA Today that IS fighters are using them as human shields. "The Islamic State began moving families living in the outskirts to the center," resident Salem al Halbusi said by telephone. "They are locking some families down inside the hospital building," added al Halbusi, who did not want other information about him disclosed to protect his safety. The civilian populace could slow Fallujah's liberators down, but those who have successfully fled the city told Reuters that the trapped population could starve before Islamic State is defeated, or be killed while they are trying to flee. Either way, all eyes will be on the coalition that the United States has helped build. As David Patrikarakos wrote earlier this week for RFE/RL, even if the IS militants are defeated quickly in Fallujah, there is a risk that sectarian tension could be inflamed further in the process. Defeating IS militarily is just the first step toward healing Iraq's and Syria's sectarian wounds and ensuring that another, similar group does not emerge. A similar pattern is playing out in the battle for Raqqa in northeastern Syria, the capital city for the self-declared Islamic State. As Wladimir van Wilgenburg explained earlier this month, efforts to defeat IS on the Syrian side of the border are being led by the Syrian Democratic Forces (SDF), a coalition that includes both Arab and Kurdish fighters. But while the SDF is diverse — and becoming more so — it is still dominated and led by the People's Protection Units (YPG), the fighting branch of the Democratic Union Party (PYD), which is closely associated with Turkey's outlawed Kurdistan Workers Party (PKK). The problem with this is that the PKK — which is designated as a terrorist organization by both the United States and Turkey — is effectively at war with Turkey, a NATO ally and a major stakeholder in the outcome of the war in Syria. In April, U.S. State Department spokesperson John Kirby told the press corps that "YPG's not a designated foreign terrorist organization. PKK is. Nothing's changed about that." Crucially, however, Turkey does not see a distinction between the PKK and the YPG. Neither do several experts whom RFE/RL consulted in researching this article. One source in territory controlled by the Kurds, who wished to remain anonymous due to security concerns, told RFE/RL that there is no doubt that the YPG reports directly to the PKK's guerrilla leadership. A report by The Atlantic Council's Aaron Stein and Michelle Foley has established the link between the YPG and PKK, and Kurdish fighters have also confessed that the two are part of the same organization. That report suggests that Turkey was willing to tolerate the YPG as long as IS and the Kurdish group were fighting each other, but that tolerance has reached its end as the fighting between Turkey and the Kurds has heated up. U.S. soldiers are supporting the YPG on the ground in Syria. 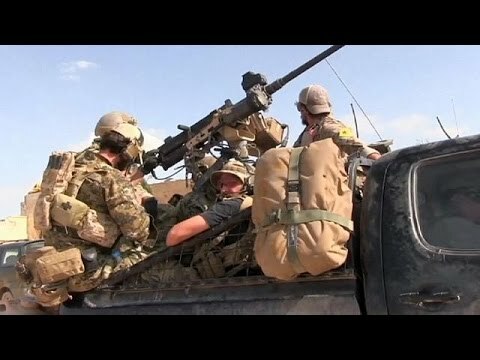 Photos taken this week by an AFP photographer show U.S. Special Forces soldiers operating alongside Kurdish fighters near the front lines in Raqqa Province. Some of those soldiers are wearing patches of the YPG and their all-female battle unit the YPJ — patches that, as Syrian expert Michael Weiss points out, are derived from the PKK's flag. Hours later, U.S. Army Colonel Steve Warren, the spokesperson for Operation Inherent Resolve (OIR), the U.S.-led coalition against IS, announced that the soldiers had been instructed to stop wearing the patches, a reversal from statements made by the military just the day before. Fighting between the PKK and Turkey has escalated in recent weeks. On May 13, a PKK fighter shot down a Turkish AH-1W Super Cobra helicopter with a Russian-made shoulder-fired SA-18 missile. Experts at The Aviationist and in Turkey said this was the first time the PKK has successfully used an antiaircraft weapon against a Turkish aircraft. While the source operating in Kurdistan told RFE/RL that the PKK have had such weapons for some time, the Washington-based Institute for the Study of War suggested that, while the weapon could have come from Syria or Iraq, "more likely that the PKK acquired the weapon from an external actor." A likely candidate for supplying the weapon is Russia, which has seen its relationship with the Turkish government disintegrate since the Russian air campaign in Syria began last September. Tensions rose when the Turkish air force shot down a Russian jet in November following several warnings from Turkey that Russian jets were violating its airspace. The idea that Russia — or its allies in Syria and Iran — could be arming the PKK has been amplified through the Turkish press. The Anadolu Agency has reported that, according to its sources, such efforts began sometime in December after the Russian jet was shot down. Regardless of whether this is true, such accusations could fuel a proxy war between Turkey and Russia, which could further inflame the region. But which side of that proxy war does the United States take if its main allies in the fight against IS in Syria are the very fighters that Turkey says are waging war against them across the border? In February, there were heavy clashes between YPG fighters in northwestern Syria and multiple rebel groups, which had been backed and trained by the CIA and Turkey. One now-infamous video showed a rebel group, Liwa' Suqour al-Jabal‎ (The Mountain Hawks Brigade), firing a U.S.-made TOW antitank missile into a YPG tank in the town of Azaz. This led some analysts to conclude that the United States was "in a proxy war with itself" in Syria since it supports some Syrian rebel groups and, via the SDF at least, the Kurdish YPG. This has two potentially dangerous consequences. The first is that Turkey is a NATO ally that is already under immense pressure. Turkey has signaled that it feels abandoned, or even betrayed, by U.S. policy in Syria, a sentiment which could weaken the NATO alliance. But Turkey is also a Sunni state, and the Sunnis already feel that they have been the victims of U.S. policy in Iraq and Syria. Both of the major offensives against IS, in Syria and in Iraq, could further exacerbate this dynamic. The sectarian tension between groups that the U.S. currently backs — whether it's the Shi'ite/Sunni tensions in Iraq or the Kurdish/Sunni tensions in Syria — should not be easily dismissed. One should remember that it was sectarian tension in both Iraq and Syria which gave rise to Islamist extremism and sectarian violence there, and the Islamic State militant group is just the newest and most radical incarnation of that tension. Victory over Islamic State is important, but if it weakens the NATO alliance or sets the stage for future sectarian conflicts, it could only be a Pyrrhic victory.